In May 2011, the tornado outbreaks continued in the midwest. A massive tornado rapidly intensified and struck the town of Joplin, MO, on May 22, 2011. The 6-mile swath devastated the heart of the town. FEMA deployed a MAT to tornado-damaged areas in and around Joplin. Preliminary field investigations occurred from May 26 - 28, 2011, with a full MAT deploying to the field on June 1, 2011, for 5 days of additional field investigations. The team’s goals are: (1) investigate and assess the performance of safe rooms and shelters, and document damages observed; (2) investigate and assess residential building performance, focusing on newer construction where possible; (3) investigate and assess the performance of critical and essential facilities; (4) evaluate the performance of large commercial facilities that were directly impacted by this event; and (5) evaluate and provide field evidence to determine the tornado ratings on the EF Scale for the evaluated locations. 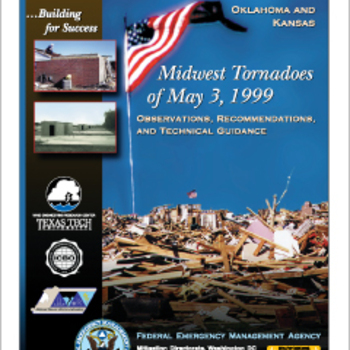 This is a presentation of the MAT report on the Kansas and Oklahoma Tornadoes. In response to the disasters caused by the May 3 tornadoes, FEMA deployed a Building Performance Assessment Team (BPAT), composed of national experts in engineering, architecture, meteorology, and planning, to Oklahoma and Kansas. The mission of the BPAT was to assess the performance of buildings affected by the tornadoes, investigate losses, and describe the lessons learned. This report presents the BPATs observations, conclusions, and recommendations, which are intended to help communities, businesses, and individuals reduce future injuries and the loss of life and property resulting from tornadoes and other high-wind events. To download the MAT report visit http://www.fema.gov/media-library/assets/documents/647. FEMA P-942 documents observations made during field visits conducted by the Mitigation Assessment Team (MAT) following Hurricane Sandy, specifically deployed to evaluate key building damages. FEMA P-942 presents the conclusions and recommendations derived from the field observations with regards to key engineering concepts, codes and standards, mitigation measures and considerations that can be used in the planning and recovery process to help minimize future damage to structures and their related utility systems. The recommendations for disaster-resistant practices in hurricane-prone regions presented are applicable to planners; decision makers; designers; contractors; building officials; Federal, State, and local government officials; building owners and operators; emergency managers; and homeowners. Observations, conclusions, and recommendations related to building codes and standards; flood protective measures; residential construction; critical facilities and key assets; and mechanical, electrical, and plumbing systems are included.